Will not fit vent rib, heavy walled or sight mounted slug barrels. Note: Images with gun/barrel for illustration purposes only. Tactical versions may require minor modification. Magpul forends and others that extend above the barrel line may conflict with the Heat Shield. Fits Most Mossberg 500 series and Shockwave shotguns, and Maverick 88 12ga and 20ga pump shotguns. Slip On Recoil Pad Adds 1" To Length Of Pull. All tooling and hardware included for installation. Designed to fit Mossberg 500 590 535 And Maverick 88 Shotguns. 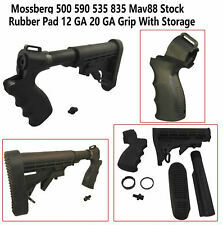 (1) Mossberg 500 Pistol grip. Fits all Standard Mil Spec Buffer Tubes. (1) Mil-Spec Buffer tube. Fits Remington 870 Pump Action Shotgun 12 Gauge. Reduces the Challenge to Reacquire the Target by Minimizing the Muzzle Lift. Accepts Rifle buffer tubes. Black Molded from Reinforced Plastic Composite. Will not fit vent rib, heavy walled or sight mounted slug barrels. This heat shield will only work with the 12 gauge pump model shotgun smooth barrels. This shield will fit 18" and longer barrels. Tactical versions may require minor modification. Product Specifications: Manufacturer: Magpul Industries Model: Magpul Original Equipment - M-LOK Type: Forend Finish/Color: Black Fit: Moss 590/590A1 Manufacturer Part #: MAG494 BLK Product Description: The M-LOK Forend is a drop-in replacement for the Mossberg 590/590A1* 12ga shotguns, featuring an extended length and front/rear hand stops for improved weapon manipulation. Now updated with M-LOK slots for compatibility with all M-LOK accessories, this Forend adds modularity to the proven Mossberg platform for sporting use, home defense, or on duty. *NOTE: Not compatible with the optional Mossberg heatshield. Removal is required before use. Made in U.S.A. E.A.R. Export Administration Regulations Controlled Product. Fits Most Mossberg and Maverick 88 12ga and 20ga pump shotguns. Does NOT fit the. 410 ga models. Manufacturer Number: 24620. This barrel features a fixed Cylinder constriction and a smooth bore perfect for Buckshot, Birdshot and rifled slugs. The barrel is 18" long and features a bead front sight. Mossberg 500 TacStar Tactical Railmount with Slimline Sidesaddle Install - YouTube. The top picatinny rail can mount a variety of accessories, yet is designed to sit just high enough to allow continued use of the shotgun's bead sight. The gas collar is no longer needed when installing this forend. Will not fit the 3-1/2" Magnum Receiver. Lightweight synthetic construction. It serves to protect the forward hand from barrel heat and adds considerable good looks to the gun. we have learned it is a much easier fit when used on the model 500 ONLY. Serving Western New York since 1976. The notch in the front of the sight serves as an indexing/anti rotation feature - slide the sight on your barrel just behind the front bead sight, and you are done! Green fiber optic front sight. Will not fit vent rib, heavy walled or rear sight mounted slug barrels. This heat shield will only work with the 12 gauge pump model shotgun smooth barrels without barrel mounted rear/mid sights. Fits 18" and longer smooth barrels. 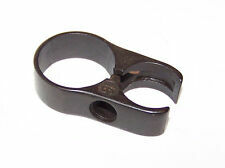 Sling Swivel Studs Accepts ATI's Sling Swivel (Part # A.5.10.2506) or any Standard Sling Swivel. Pre-Drilled to Accept Shotgun Shell Holder. Sling Swivel Stud Included. Textured Pistol Grip. Compact for Transport & Carry. NDZ Performance has NO affiliation in any manner with, or otherwise endorsed by, O.F. Mossberg & Sons. NDZ Performance High Visibility Low-Drag Aluminum Shotgun Follower for Mossberg Shotgun Model 500 535 835 590 & 930 - Red. Will only fit on Maverick 88 and Mossberg 500 12g with the 5 shot magazine tube. Parts are from new Maverick 88 guns that have been parted out. This spike comes from Black Aces Tactical and replaces that boring old tube knob look with a tactical spike. Great way to finish off that custom Mossberg look. This spike will fit both 12 & 20 gauge models. Spike is made from the same anodized aluminum the Black Aces Tactical rail is made from. Comes with spike and set screw, magcap not included. Requires the removal of the sling point on the forend knob. SPECS ---1" Long ---Type 2 Black Anodized Aluminum ---Comes with 10-32 Attachment Screw Made in the USA. NDZ Performance High Visibility Low-Drag Aluminum Shotgun Follower for Remington 870 1100 1187 - Red. Our Billet Aluminum Enhanced Low-drag Follower replaces your factory steel or plastic follower for added reliability and safety. Most 12GA pump shotguns The Phase 5™ Low Drag, High Visibility 12 Gauge Shotgun Follower (12GSF) is designed to feed smooth with no binding in most factory 12-gauge magazine and extension tubes. Note: Fits in most factory 12-gauge shotgun magazine tubes and extension tubes WITHOUT spring/follower retention dimples. It is your responsibility to know what YOU can and cannot own. Replacement rear pistol grip for MOSSBERG 500, 590, 88 Shotguns only Price is for grip only - as below: No tube, end cap, stock or anything else is included. NDZ Performance has NO affiliation in any manner with, or otherwise endorsed by, O.F. Mossberg & Sons. NDZ Enhanced Tactical Slide Safety for Mossberg Shotgun 500 590 835 930 935 Shockwave Red. NDZ Performance Enhanced Tactical Slide Safety for Mossberg Shotgun Model 500 590 835 930 935 & Shockwave. REMINGTON 870 SHOTGUN SIDE SADDLE SHELL CARRIER. The mounting plate is black anodized aluminum. Quick and easy install. Quick detach design. Heat Shield for 12 GA Mossberg 500 / 500A / 590 / Maverick 88. 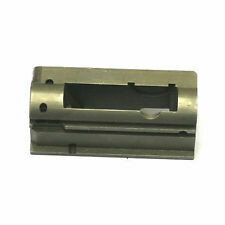 Will fit Mossberg 500, 500A, 590 12 GA Smooth Barrels. WIll fit Maverick 88. Will Not Fit 590A,Shockwave, Ventilated Rib or "Heavy Walled" Barrel Models. This Mini-Clip allows for perfect fast or slow pump action function in the Mossberg and Maverick Shotguns. Fits: 12ga Mossberg 500, 590, 590A1, and Maverick 88 models. 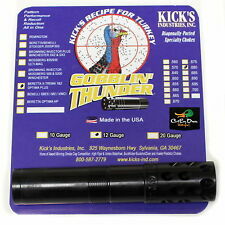 Allows use of 12ga 1.75” Birdshot, Buckshot, and Slug shells. NDZ Performance has NO affiliation in any manner with, or otherwise endorsed by, O.F. Mossberg & Sons. NDZ Performance Tactical High Visibility Low-Drag Aluminum Shotgun Follower with Enhanced Slide Safety for Mossberg Shotgun Models 500 535 835 590 & 930 - Red. MossbergÂ® 500/590 Receiver Picatinny Rail Mount for mounting Optics to your Shotgun. Low Profile Picatinny Rail design with See-Through Channel allows you to still use the Front Bead Sight. Screws included for mounting rail to Shotgun Receiver. The easy slip on. 5" extension recoil pad is a step forward in design and technology. State of the art design, injection molding and space age high-density plastics are combined to create this which cannot be duplicated in any other material. Single-handed firing is also made much easier. But know that even though we are branching out, our roots still run deep. In fact, that's our goal. So reach out! We are here to help and we look forward to hearing from you soon. This is our model designed specifically for the Mossberg 500 that will cost effectively allow you a standoff / breaching option as well as an aggressive less-lethal deterrent, by simply attaching to your Take Down Screw. Why Gunine DuPont Viton?. Becouse its the best in the industry, Others use chinese knock - off FKM material. When you go to shoot, use the best! They are manufactured from 17-4 heat treated stainless steel and have a matte blue finish. Our Extended Turkey Choke Tubes feature a 1.050" parallel section to produce the optimum pattern with your shotgun. 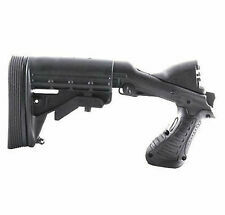 New Mossberg 590 Shockwave Quad Rail w/ Shell Holder & Forend Spike - Black Aces Tactical. Black Aces Tactical newest shotgun product follows a long line of tactical rails for the most popular shotguns on the market. Mossberg Shockwave Flashlight Mount: GGG-2007. Can be mounted on either side of the Mossberg Shockwave to accommodate both right handed or left handed. Perfect for mounting a tactical flashlight to your Mossberg Shockwave. Mossberg M835/M935 Ported Turkey Choke Tubes. 675. Designed for the serious turkey hunter, each Super Full Choke has been specifically bored to throw the optimum pattern at short and long distances. Each choke is ported allowing gases to escape quickly reducing recoil and muzzle jump in the process. Gen 2 features a bolt hole plug--counterfeits don't. Want to run your shotgun with a more tactical and compact look Simply screw the end cap into the pistol grip and you are good to go. The sling swivel detaches with the simple push of a button, and allows you to attach a variety of tactical slings. Product Specifications: UPC Code: 743108050156 Manufacturer: Hogue Grips Type: Stock Finish/Color: Black Accessories: With Forend Description: Piller Bed Fit: Mossberg 500 Manufacturer Part #: 05015 Product Description: Tamer Shotgun Pistol Grip and Forend For Mossberg 500, 590 & 835*** *** Forend Adapter Nut for Mossberg with a 6.75? Forend Tube. All model 835, most 590 and some 500 will require this adapter nut. Black OverMolded® The entire forend is OverMolded with soft rubber for outstanding shotgun handling characteristics which facilitates fast easy mounting and sight acquisition. The grip also features ambidextrous ergonomic palm swells. ***PLEASE NOTE: The factory clamshell packaging makes packaging and shipping this item both difficult and costly. 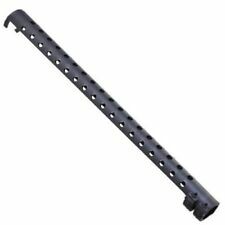 Fits Mossberg 500 590 TACTICAL Shotgun Forend & Stock 7 3/4" Grip LIFETIME GTY!! Whether you use your tactical shotgun for hunting, target practice, or personal protection, it is important to have the right parts. The parts and accessories of a tactical shotgun can impact its performance as well as your enjoyment when using it. What qualities should you look for when purchasing shotgun accessories? With so many different options for accessories and parts for your tactical shotgun, it can take some time to find what you need. Looking at a few specific factors can help narrow down the options that would be right for your needs. When purchasing tactical shotgun accessories, you should look for and consider several factors. Brand and Type: Whether you own a Remington, Mossberg, Benelli, or another brand of tactical shotgun weapon, be sure you are purchasing the right brand and type of parts to go along with your gun. Many parts are brand specific and will not work or work as well in other brands of guns. Quality: Shotgun parts and accessories are generally of better quality and more reliable if they are plated to meet military specifications. Check the materials used in manufacturing. Materials such as textured rubber, fiberglass, and polymer are usually more durable and long-lasting. You may also want to research where they are made. Ergonomics: Depending on your comfort and your preferences, you may want parts that are ergonomic, such as side saddles, charging handles, and sling attachments. Safety: For your safety, the edges of the manufactured shotgun parts should have been deburred and dehorned. What types of accessories do you need for a shotgun? Sights: Without a quality sight on your gun, you cannot make use of its full potential. These extend your range and accuracy. Ammo Carriers: Depending on your use of your shotgun, you may keep birdshot loads, buckshot loads, and slug loads on hand. Everyone should have some sort of ammo carrier, such as an ammo loop that fits onto the side of the shotgun receiver or a leather or elastic boot that fits into the buttstock of the gun. No matter what kind of ammo carrier you use, keep in mind that you do not want to add too much extra weight. Slings: Whether you are a marksman or a defensive shotgun owner, you will want some kind of sling or strap to help carry and hold your firearm.